Before going out and buying a WordPress theme or hiring a web designer, Realtor’s need to be familiar with their own marketing style. Their real estate website should reflect everything about their style and brand. Here are five of the most popular real estate marketing styles. Social Gurus are always on Facebook, Instagram, Pinterest, LinkedIn, and Snapchat. That’s where they connect with leads and build relationships. Social Gurus also nurture past client relationships online for referrals. They need websites that connect to all of their social media channels, offer personalized blogs, and bring their followers back to their website for lead capture. Neighborhood experts position themselves as local authorities. They are the agents that farm their territory every week. Neighborhood experts know everyone’s name. They know the best schools and where to find the best cup of coffee. They need websites with neighborhood landing pages, custom neighborhood IDX searches, SEO optimization for their territories, and the ability to farm their area online. Branding Icons are the Realtors who always put their brand first and foremost. Their logo is everywhere. Their name stands for an experience. Most luxury Realtors are branding icons. When you see their logo, you know the type of experience you are getting. Their websites rely heavily on branding and stunning photographs. Their websites are usually minimalistic, focusing on connecting leads directly with the Realtor for an exclusive experience. Direct Advertisers are the Realtors that you see everywhere. They are on Facebook ads, mailers, local magazines, billboards, and bus stops. Direct Advertisers get their clients by being ever present. They achieve this through paid advertising. Direct Advertisers need websites with powerful lead capture mechanisms that generate inquiries and leads. They also want help converting their leads with a CRM. Everyone knows their name but they need a website that demonstrates their value and converts leads. Most Realtors are a mixture of the four marketing styles. They have tried different types of advertising throughout their business experience. The key is to tailor their web presence around what works for them. 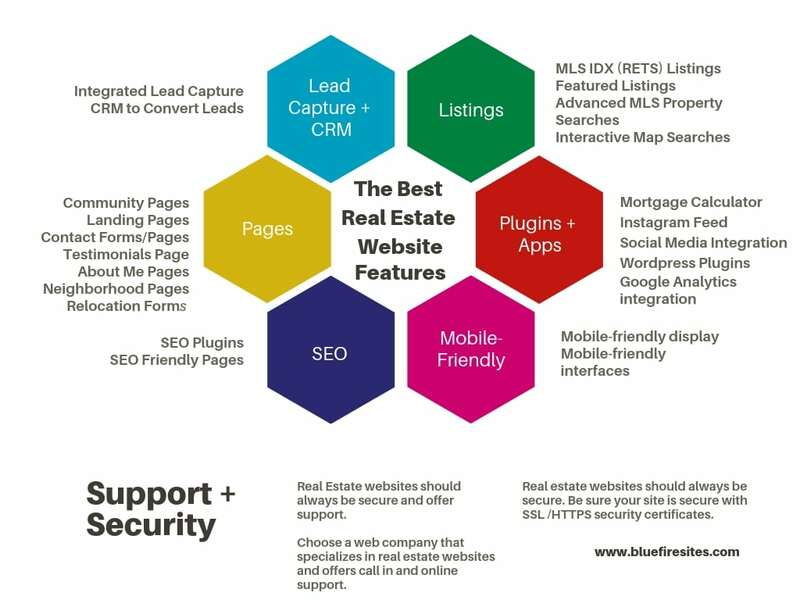 Regardless of how you run your business, Blue Fire Sites will help you build the real estate website that fits you best. Once a Realtor identifies their unique marketing style, it is time to figure out how to present their brand online. There are two ways to do this. The first is to purchase a WordPress theme and customize it yourself. The second is to hire a real estate website designer. We recommend the second option because most Realtors are going to want to integrate IDX (RETS) listings into their website. It is very important to choose a web designer that specializes in real estate websites because of this. Custom designer’s, like Blue Fire Group, offer tailored websites for each Realtor. The process begins by selecting a theme from an extensive real estate gallery. Then, further customize your site by working with a real estate tech specialists. Your site should reflect your marketing style as well as the interactive real estate features. When shopping for a WordPress real estate theme or real estate web designer, it is important to make sure your site has the best real estate web features. Leads do not want to log on to sites that offer them no value. Your aim should be to add value to your leads’ lives. By making sure your website reflects your marketing style and has the best features, users will opt to stay on your page longer and make contact. By combining the best real estate website marketing style and features, any Realtor can tailor the perfect site for their business. Does your website reflect your marketing style? If not, check out Blue Fire Site’s Cyber Monday deal offering tailored real estate websites for $299.